Perhaps you have already seen this piece. It is making the rounds on the interwebz of late. This is Justin Ellwood's one-off Amuse exhaust system. There is no project more fitting for this piece of art to be featured than Justin's Z34. Enduring the long delays is one of the few downsides of buying Japanese parts, however, seeing the final product, one would assume that an 8-month wait for this system was surely worth it for Mr. Ellwood. A man who has not cut any corners with his build and refuses to adorn his pride and joy Z project with anything other than legitimate, authentic parts, this exhaust system will be right at home on the 800+ horsepower beast. Well done, sir. Keep up the good work! When I purchased my Jeep back in January, one of the very first things I noticed was the wear on the steering wheel. It is not falling apart or significantly distressed in any way, but it shows some signs of use, which is to be expected from a 9 year-old vehicle. So, early on, one of my plans was to have my steering wheel re-wrapped. Fast forward to a couple weeks ago. I sent payment. They did all the work within a few days and sent me some pictures. The wheel came out great! As stated, the wheel looked great! I was happy. They shipped it out to me. I had it within a few days and took the day off from work and made arrangements with my shop to have the new wheel installed. 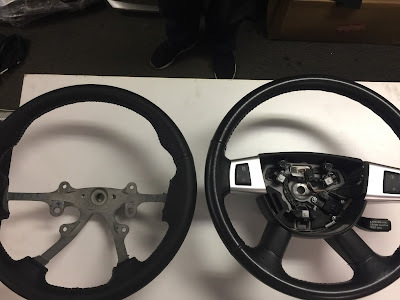 My mechanic removed my OEM steering wheel and found out that, although the "face" of the two steering wheels are the same, the bases are completely different. 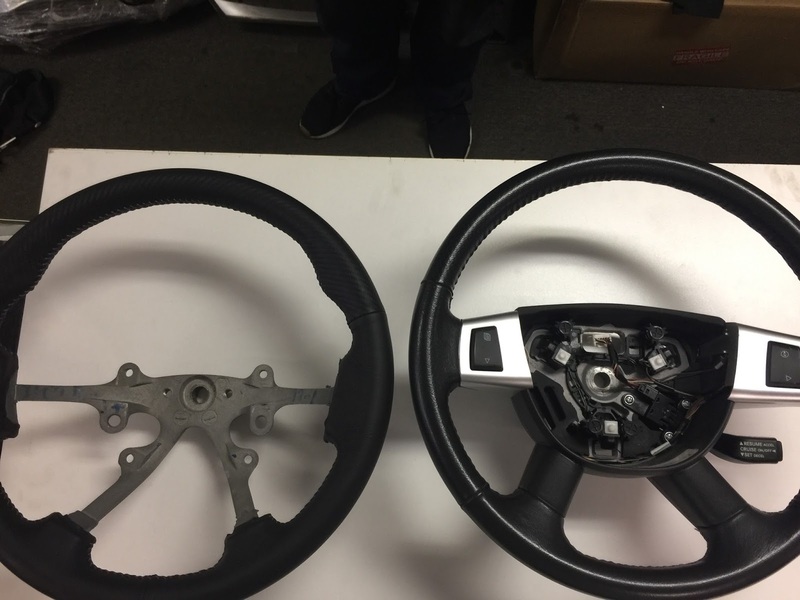 After doing some research, I learned that the steering wheel I received from Dallas Custom Steering Wheels is made for a 2005-2007 Jeep Grand Cherokee; not the 2008-2010 steering wheel that I need. I contacted Dallas Custom Steering Wheels and explained the situation and asked if I could return the steering wheel and be refunded. I was told that I could return the steering wheel and be refunded, but that I would be charged a 30% restocking fee. I expressed my displeasure at being charged a 30% restocking fee for what was their mistake. I had told them the make, model, and year of my vehicle when I initially inquired and I was told they had the steering wheel in stock that would fit. The gentleman I was emailing told me that because they had sent me pictures prior to purchasing that it is my fault. As mentioned above, there is no way to know that the bases of these two steering wheels are completely different if one has never removed the steering wheel before. I told them the vehicle I own. They told me they had a wheel in stock. When you have the words "steering wheel" in the name of your business, one assumes you actually know steering wheels. One assumes there is a level of expertise. One assumes that the company will not deflect the blame back on the customer. I think having to pay 30% to return a product that I received and cannot use due to a mistake by the seller is a bit absurd. By this logic, Dallas Custom Steering Wheels could continually mislead buyers into buying products that do not fit their vehicles and, upon realizing it and asking for a refund, demand a 30% restocking fee, leaving the buyers without much recourse. Either way in this situation, I lose. Ultimately, I do not believe I am at fault here. I gave them the year, make, and model of my vehicle and they told me they had the product that would fit it in stock. They were wrong. That should be the end of it. Now I am stuck with a $600+ steering wheel that they sold me after telling me they had what I needed in stock. Of course, I never would have purchased this product if they did not tell me they had what I needed. I realize there are many satisfied Dallas Custom Steering Wheel customers out there. I am just relating my story. Not only will I refuse to pay the 30% restocking fee, I will never give another dollar of my money to this company.